This year we stuck around for Thanksgiving instead of going up to Massachusetts. It was our first time not traveling, so for the first time we got to got to plan a Thanksgiving meal. Instead of making a traditional turkey we decided to make lamb. As long as you are roasting a large amount of meat, I think anything goes. Luckily for us finding recipe ideas was pretty easy thanks to the Lamb Rules issue that Saveur recently did. They had what sounded like a great recipe, a leg of lamb that is braised in a white wine liquid for seven hours. There were only going to be three of us having dinner so I didn’t go for the whole leg of lamb. 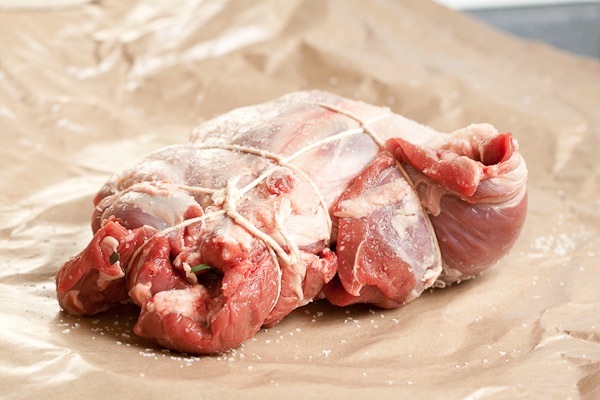 They didn’t have any half legs of lamb with the bone in, so I went boneless, which allowed met to practice my butcher tying skills. While the thought of having a leg of lamb slowly cooking for seven hours sounds pretty good, I didn’t want to tie up the oven for the whole day; we had a lot of other tasty treats to make. So instead of using the oven, I adapted the recipe for the slow cooker. I actually didn’t have to change too much. The only trick was that in order to get the crock pot to simmer, I had to switch it back and forth between warm and low. If I left it on low, it would have gotten too hot and gone to a full boil. The recipe included a great dean dip to serve with the lamb. It is great and totally worth the effort. You don’t need to soak the beans overnight, you just may need to cook them for a little longer. The lamb probably doesn’t need the full seven hours of cooking, but if you keep the temperature low, it shouldn’t hurt it any. If you are pressed for time, just cook it until it is tender and falling off the bone. 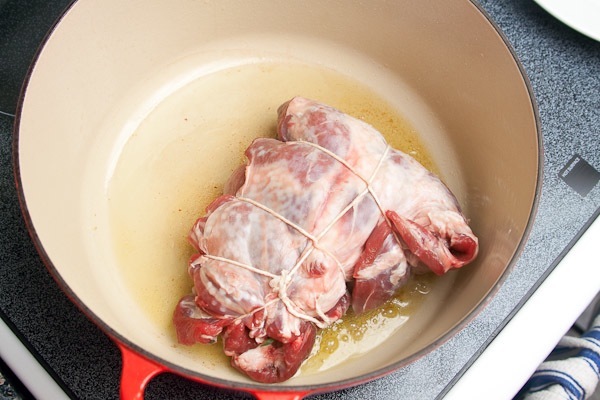 Depending on the size of your slow cooker, you may need to get a boneless cut and tie it. There is a great video on how to tie a roast here. 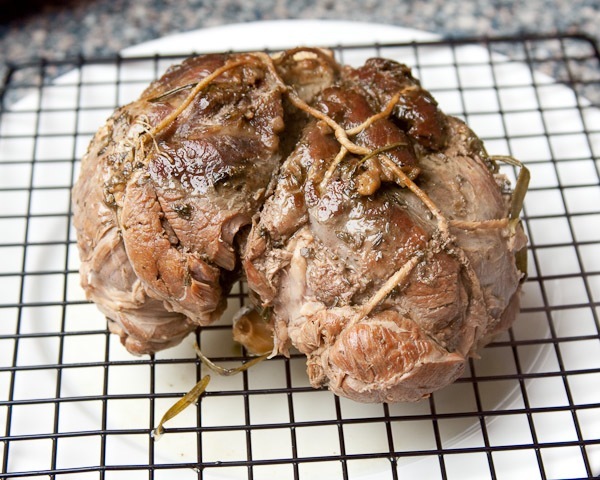 I placed a bunch of cloves of garlic and a few sprigs of rosemary in the middle of lamb before tying. I also used a fat separator to remove the fat from the cooking liquid and made a great gravy for the lamb and beans. 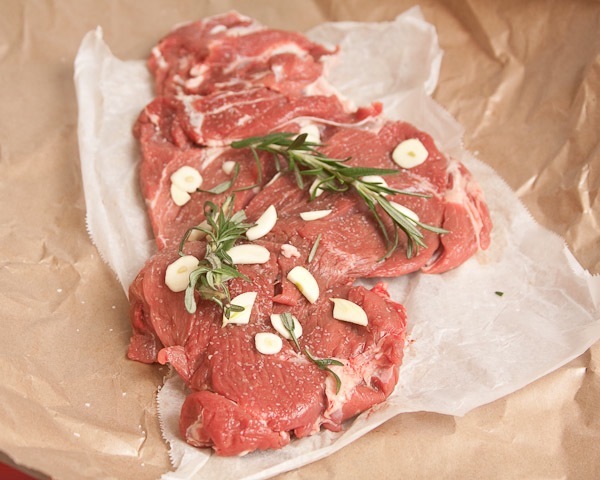 If the cut of lamb is boneless, tie. Rub the lamb with oil and season generously with salt and pepper. Heat a 6 quart Dutch oven or large pan over medium-high heat. Add lamb and cook, turning occasionally, until browned on all sides, about 12 minutes. Transfer lamb to a plate. 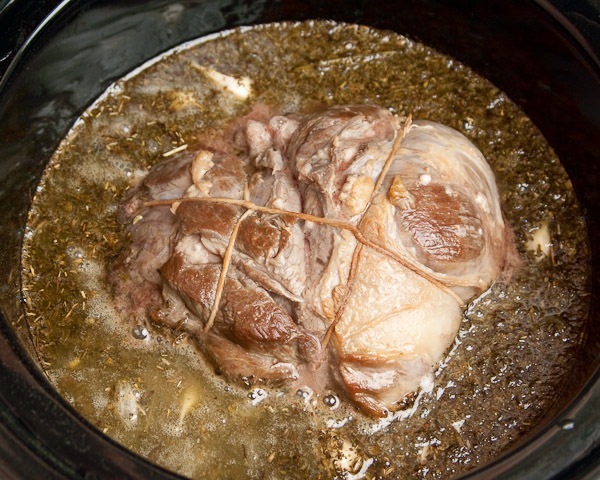 Nestle garlic and herbs into crockpot; place lamb on top of herbs; add pan juices and any brown bits from Dutch oven. Add wine and 2 cups water to the slow cooker. Cover and leave on high for 3 1/2 hours. 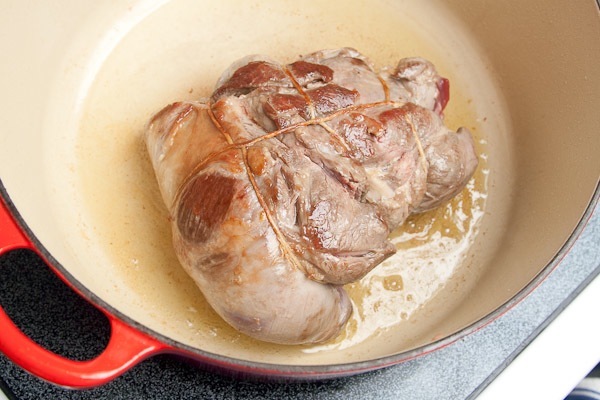 Turn the lamb 3-4 times as it cooks. Turn the slow cooker to low and try to keep it at a low simmer. Cook until the lamb is very tender, about 3â€“3 1/2 more hours. Transfer to a rack, cover with foil and let cool for 20 minutes. Meanwhile, prepare the beans: About 1 1/2 hours before the lamb is done, drain beans and transfer to a 4 quart saucepan along with 6 cups water, 4 cloves garlic, and the herb bundle. Insert the cloves into the onion and add to the pot. Bring to a boil, reduce heat to low, cover, and simmer until beans are tender, about 1 hour. Remove pot from heat and season with salt and pepper. Discard herbs and strain beans, reserving cooking liquid. 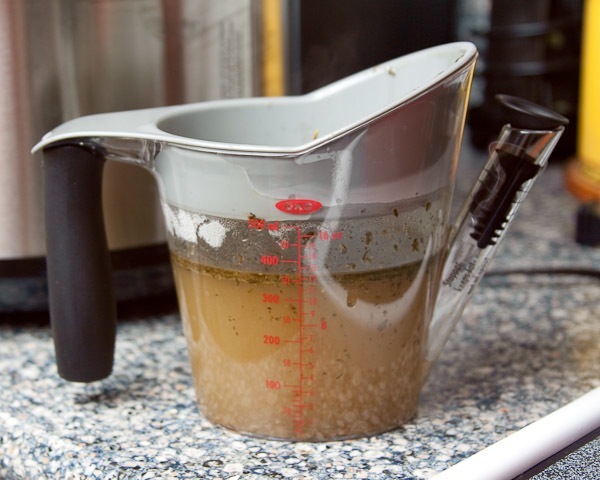 Transfer 2 cups beans, 1â„4 cup cooking liquid, oil, crÃ¨me fraÃ®che, and remaining garlic clove to a blender and purÃ©e. Stir purÃ©ed bean mixture and about 1 cup of the cooking liquid back into pot and cover to keep warm until lamb is cooked. 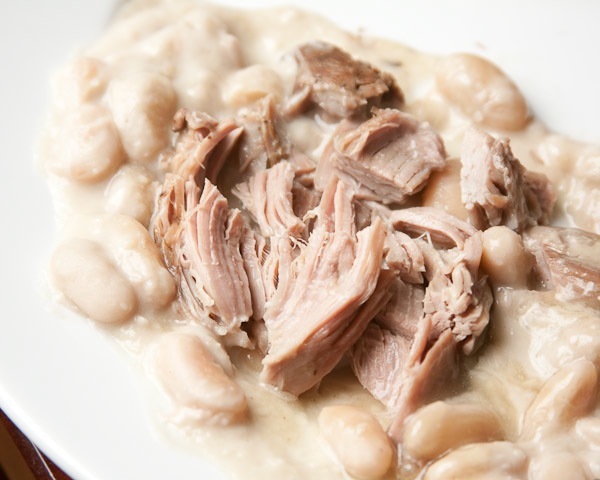 Serve the lamb sliced or torn into chunks, alongside the beans.